Jeremy and Trista Thompson, Decorah, would like to announce the birth of their twin sons, Harris Dean and Flynn Jack. John and Joann Svendsen of St. Lucas would like to announce the birth or their son, John Adam Dennis Svendsen, born at 7:53 p.m. Jan. 23, 2016. 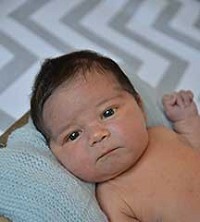 Barrett and Jennifer Gipp, Decorah, announce the birth of their son, Ethan Michael Gipp, at 8:03 a.m. Friday, Jan. 22, at Gundersen Health System in La Crosse, Wis.
Ali Elizabeth Schmitt, daughter of Shaun and Kendra Schmitt, was baptized Sunday, Sept. 21, 2014, at St. Aloysius Catholic Church in Calmar. 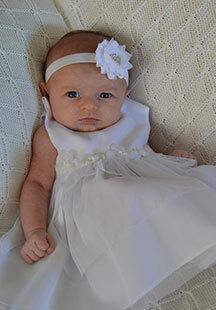 Joe and Lisa Perry of Gilbertville, would like to announce the birth of their daughter, Raelyn Marie. 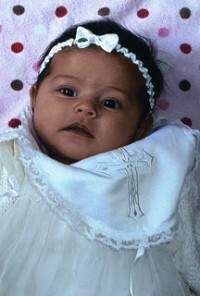 Eva Marie Schmitt, daughter of Shaun and Kendra Schmitt, was baptized Sunday, April 21, at St. Aloysius Catholic Church in Calmar. Eva Marie was born to proud parents Shaun and Kendra at 4:58 p.m. on Saturday, March 2, 2013, at Winneshiek Medical Center in Decorah. Aaron and Sarah Prestemon of Fond du Lac, Wis., announce the birth of their son, Hoyt Charles Prestemon. Hoyt was born March 8, 2013, at St. Agnes Hospital in Fond du Lac, Wis. 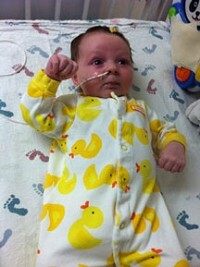 He weighed 7 pounds, five ounces and measured 19 inches in length at the time of his birth. Hoyt is the first child for Aaron and Sarah. Bryce Alan Peters, son of Daniel and Jennifer Peters of Cedar Rapids, was baptized by Fr. Neil Manternach Saturday, July 30, 2011, at St. Elizabeth Ann Seton Catholic Church in Hiawatha. 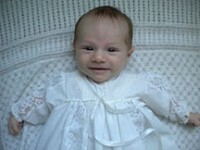 Nora Constance McDonald was born Aug. 29, 2011, in Hixton, Wis. She is the daughter of Brandy and Adam McDonald. 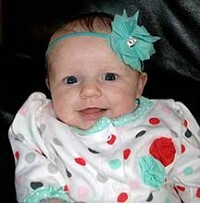 Mylee Jean Hageman was born Sept. 7, 2011, at Veterans Memorial Hospital in Waukon to Trevor and Tori Hageman, of Ossian. Austin Edward Erickson was born Aug. 2, 2011, at the Winneshiek Medical Center. He weighed 6 lbs. and was 20 inches long. He was born at 3:50 p.m.
Gavyn Coralee Darrington was born July 29, 2011, at 7:54 am. She weighed 7 lbs. 5 ounces and was 20 inches long. Ben and Erin Mettille of Lansing are happy to announce the birth of their son, Eliyas Gerald Lansing Mettille, June 3, 2011, at Gundersen-Lutheran Hospital in La Crosse, Wis.
Eva Rose, daughter of Richard and Kayla Hasvold, was baptized at Union Prairie Lutheran Church in rural Lanesboro, Minn. Sunday, May 15.